In my job there are several times where I need a fan to include in an enclosure. 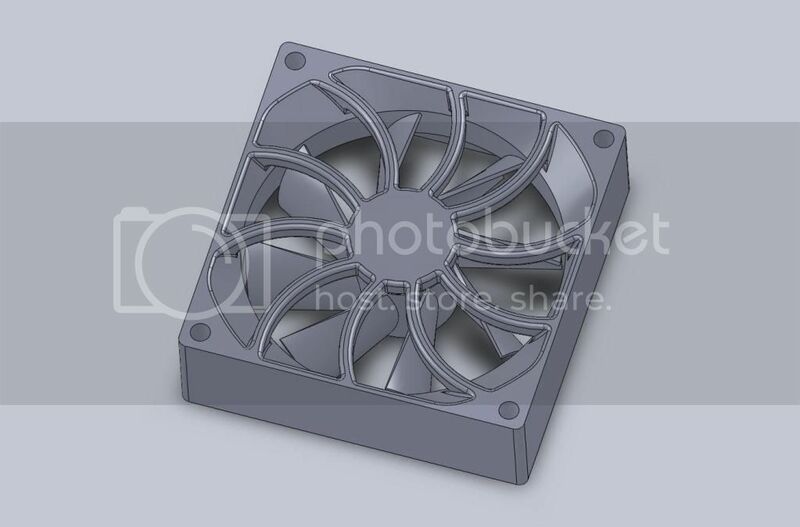 Some times you can find cad files of these fans(SW actually has one), but some times its just easier to model it yourself. This is a simple representation of a fan. Obviously you can put as much detail into the model as you wish. In most cases just a block with bolt holes will be adequate but I like to go a little further. First obtain a dimensioned drawing of the fan you wish to model. Every manufacturer offers these drawings. 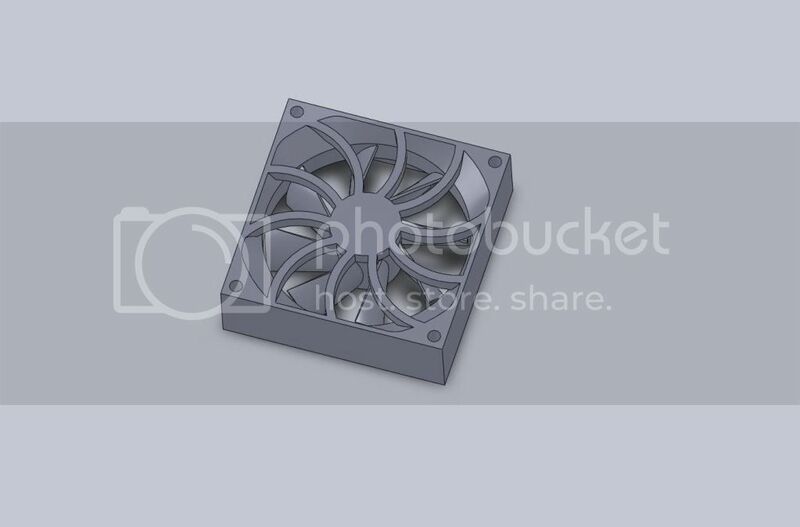 The one I am modeling is an 80x80x24.4mm fan and can be found here. The first step is to start a new sketch on the Top plane. I like to start with a circle centered at the origin. 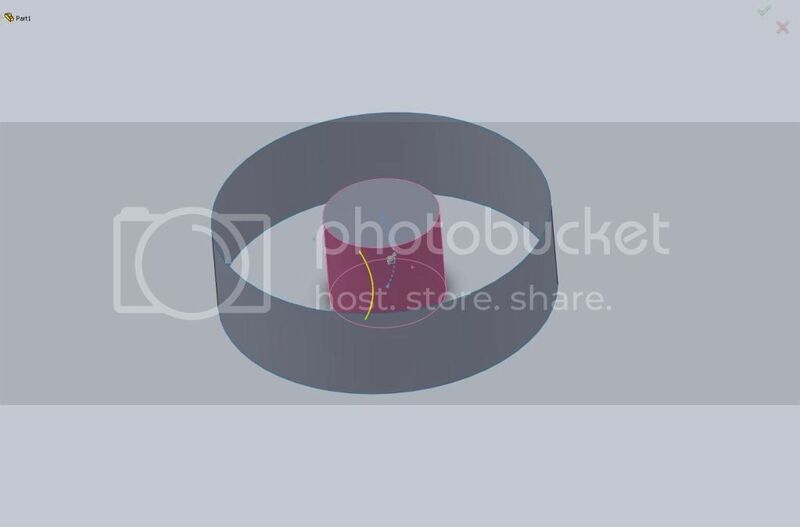 Immediately give this circle a dimension. 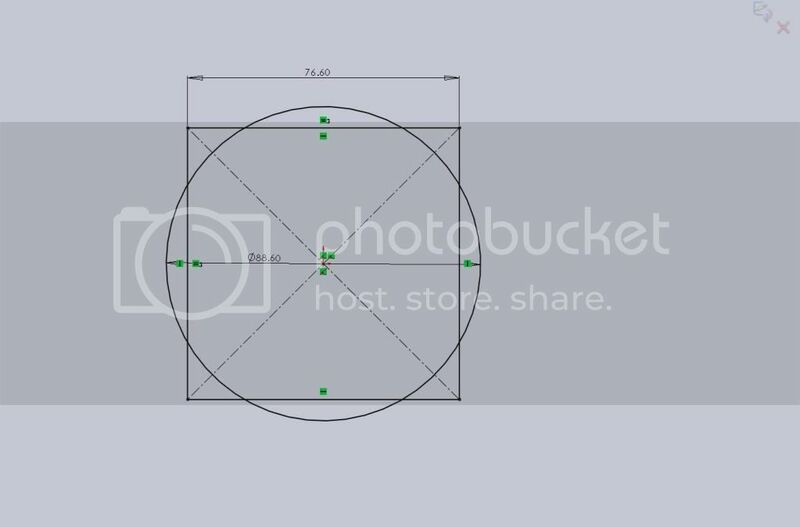 In this case it will be 88.6mm as shown on the Mounting Panel Cutout portion of the pdf. Next step is to draw a box(use the center point box option this will add some construction lines and relations that will help you. The first thing I like to do is add an = relation to the top edge and one of the side edges. This ensure that we have a square(since the fan is square). Then I add a single dimension to the box giving it a width of 76.6mm. Because we used a center point rectangle and we used the = relation everything is nice and centered. 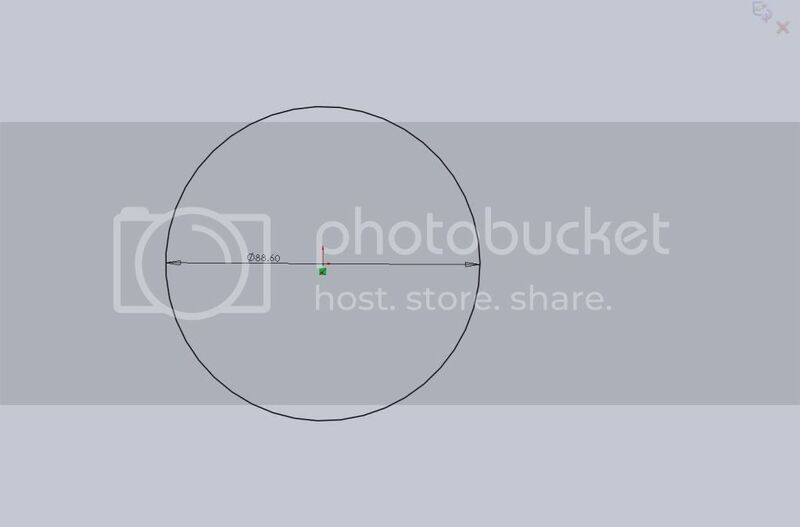 Once we start trimming things, these relations will be deleted but it is a good idea to keep this in mind when modeling. Next go ahead and trim away the unwanted sections. You will notice your nice fully defined sketch is now under defined. Thats okay because we know nothing has moved and there is a simple solution. When a sketch is under defined you have the option to let solidworks fully define the sketch. Since we know everything is where we want it, we use Fully Define Sketch and modify some of its options. You can specify to add relations, dimensions or both. You can also get really specific as to what types of relations and dimensions you wish to be added. In this case make sure Dimensions is not selected and only allow it to add relations, then Calculate. (note, fully define sketch is located on the drop down with View relations and Add Relations.) Using only relations, the sketch is now fully defined. I have kept relations visible so you can understand a little better what is added. Also note that reference lines do not need to be fully defined for a sketch to be considered fully defined. Next step is to add another center point rectangle. 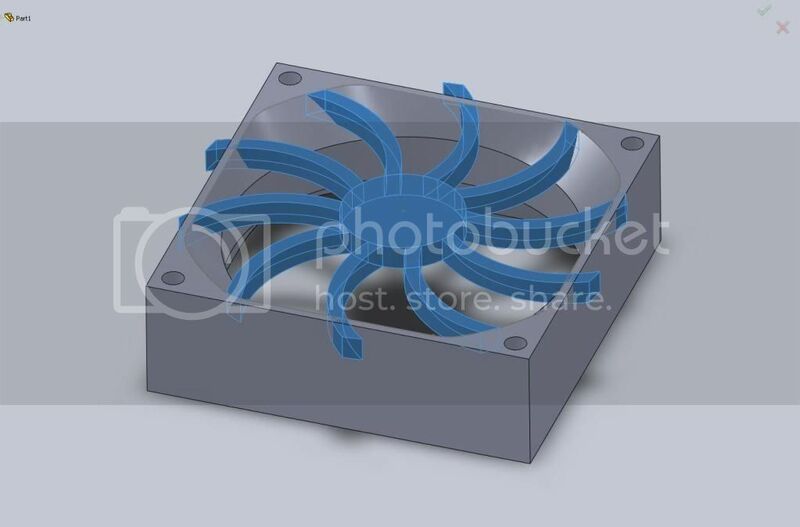 This one will define the outside of the fan which in this case is 80 x 80mm. 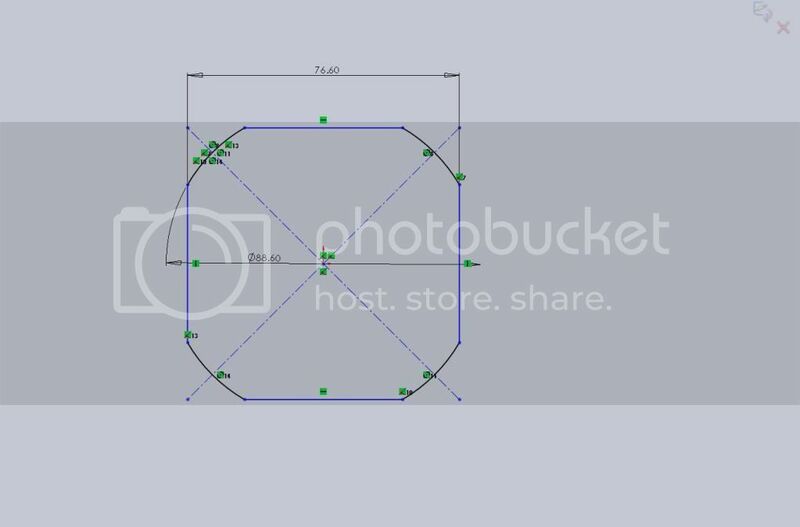 Again this is centered at the origin and you want to add an = relation between one side and the top(or bottom) edges. At this point its time to add the bolt holes, but before that I am going to add two more construction lines. I am going to add a vertical and horizontal infinite length line through the origin. This will give me mirror lines for the bolt holes. Normally construction lines are my first step but I didnt need them until now and I didnt want to clutter up the screen shots. Add a hole at one of the corners being careful that you dont let any relations add themselves. If you are ever having trouble with auto-relations while sketching you can hold down the CTRL key and it temporarily disables them(while the key is pressed). 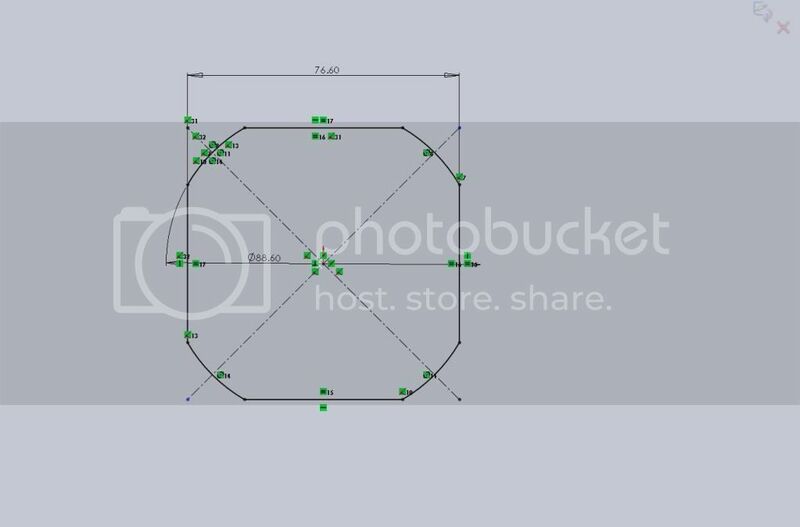 The pdf shows the holes are 71.5mm apart so from our construction lines we are 35.75mm away. 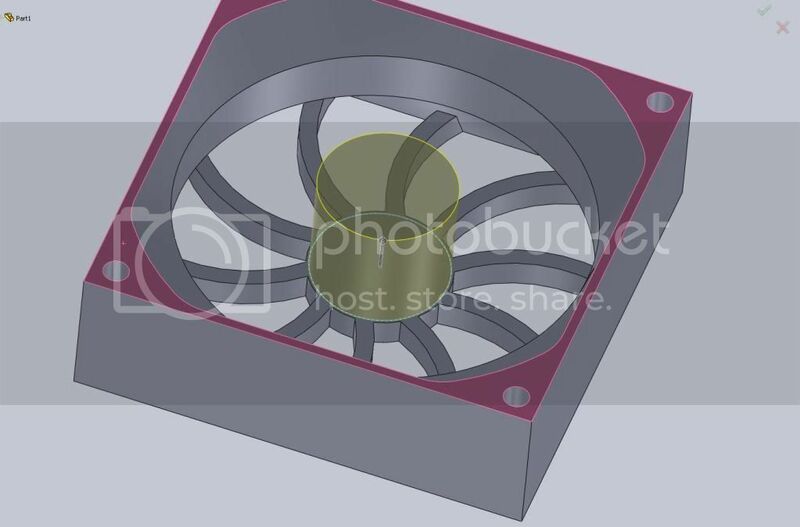 You should now have a fully defined sketch of the outside portion of the fan body. 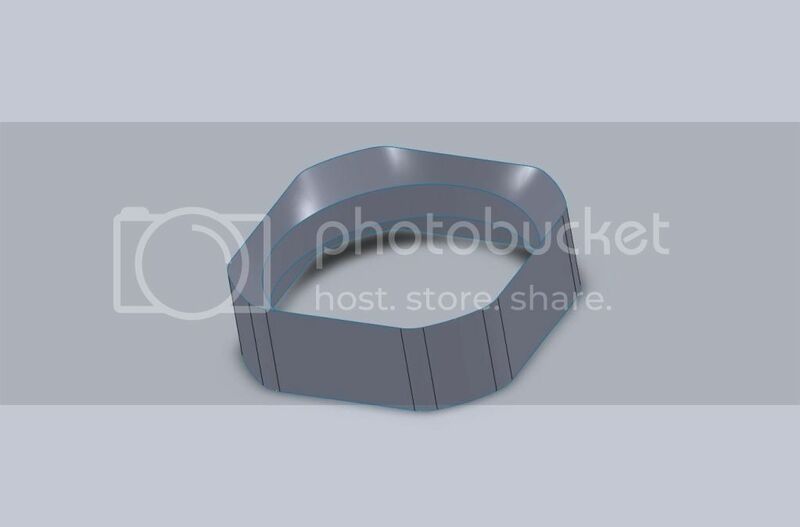 Exit the sketch and extrude this 25.4mm. One note, change the direction from Blind to Mid Plane. This will keep the Top Plane in the middle of the fan and come in handy in just a bit. Normally you leave fillets to the very end of a model, but in this case we need to add some fillets now or the next step will not work out for us. This is also a good time to take a look at FilletXpert. When you select the fillet option on your feature tab you will have the option to create Manual fillets or use FilletXpert. One of the great benefits of filletXpert is that it allows you to select one edge, and then you are given options for other edges like it. 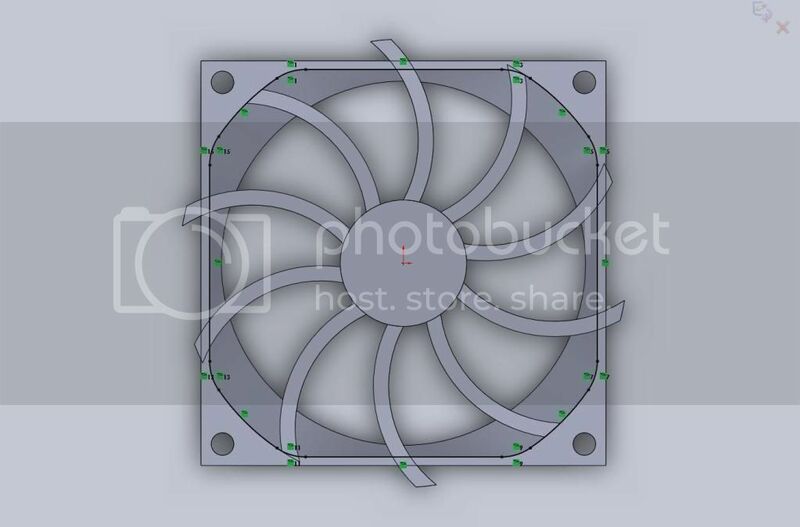 So in this case we need to fillet 8 vertical edges inside the fan body. When you select one edge a pop up next to the cursor will give you the available options which will highlight on the model. You can see them in pink. While 8 edges doesnt seem like a lot, this can be extremely helpful in many different ways. Add a 10mm fillet to the 8 vertical edges. Now start a new sketch on the Top Plane. 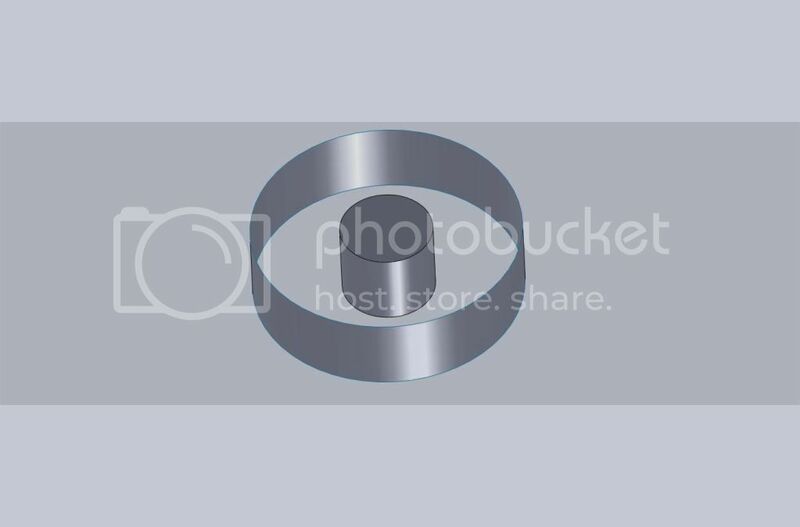 This time draw a circle at the origin with diameter 72mm. This circle will represent the inside of the fan. Exit the sketch and go to the Surfaces tab and select Extruded Surface. We want this to be 10mm tall and use the Mid Plane direction option. We are going to make a combination of surfaces and knit them together to form a solid for this piece. 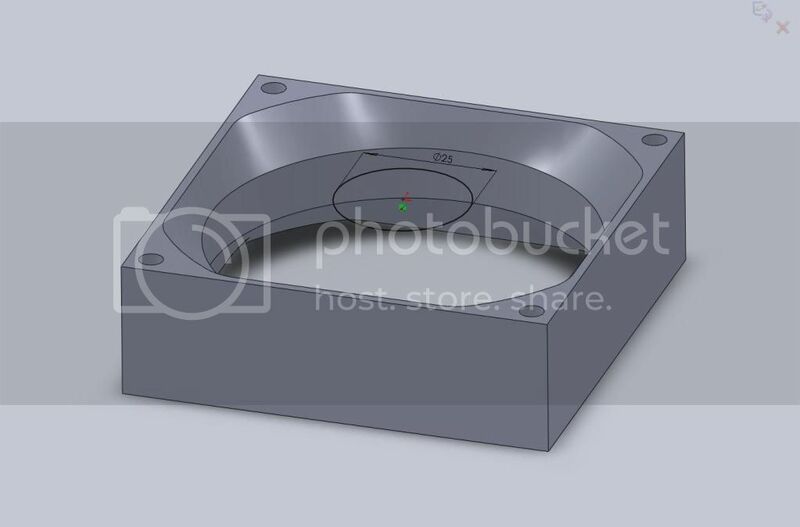 Before we make any more parts find the Offset Surface button and create an offset surface with distance 0 of the inner faces of the fan body. After this surface is created, expand the Surface Bodies folder in your Feature Tree and Hide it. The reason we hide it is because for these next surfaces we want to make sure we select the edge of the solid body. 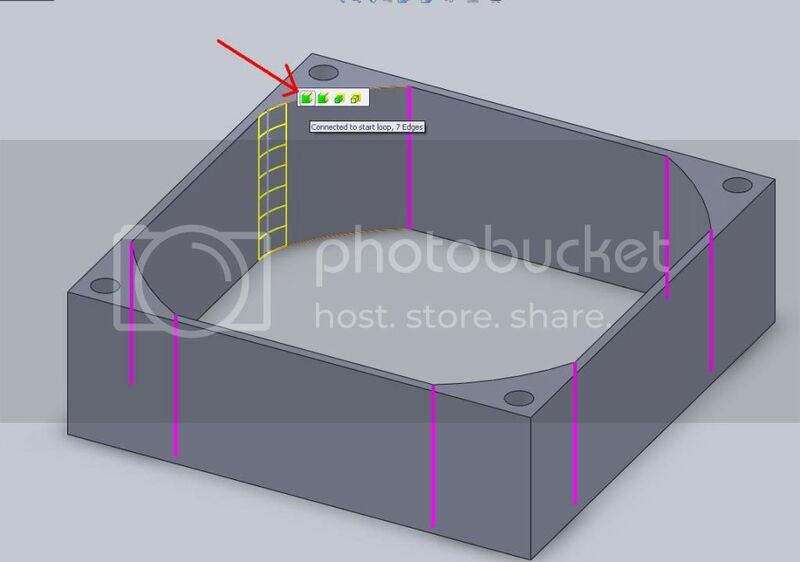 In this specific case it wouldnt make a difference but there are times when the offset surface may not exactly match and could potentially cause issues. When possible use original geometry and not a copy for things like this. Now we want to do a Lofted Surface. 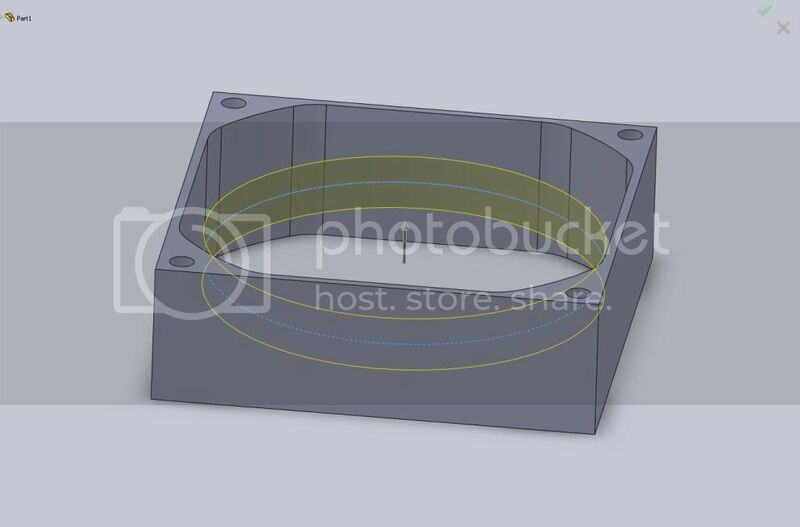 Your first profile is the upper edge of the extrude surface we created. Next you will need to Right click and use the Selection Manager. In the selection manager pop up box you need to make sure "select group" is active. 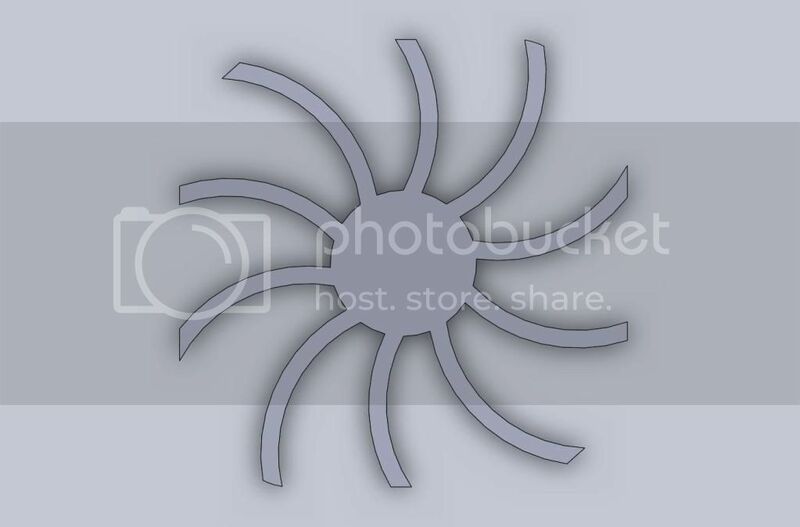 This is the icon with 3 cursors. Then proceed to select the top edge as shown. Once you have select the entire edge OK the dialog box and you should see a preview. An important note here is the location of the Green endpoints on the profile. These are free to be drug around the model. You want to be sure they line up or the loft produced will be twisted. After you OK the loft you should see a nice surface blending from our solid body down to the extruded surface. Go ahead an mirror this lofted body across the Top Plane(this was the reason for the MidPlane extrusions.) You will need to make sure you select Bodies to Mirror then select your loft. 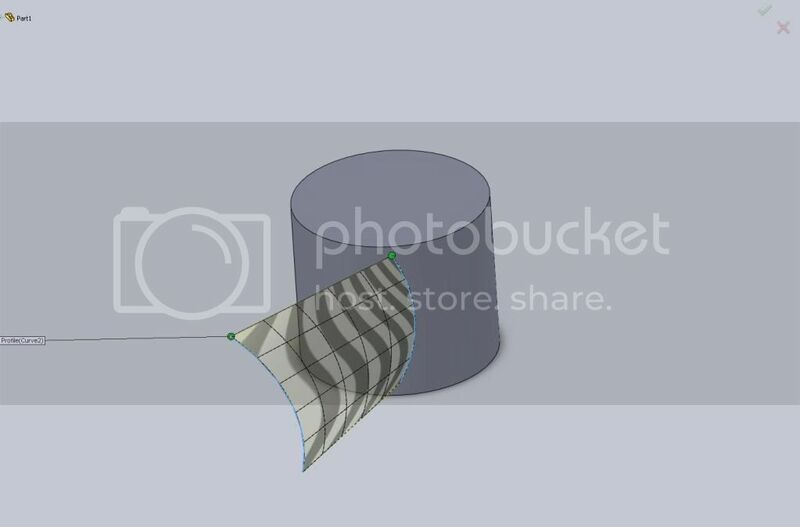 Now go back into your Surface Bodies folder and make the Offset surface visible. Also hide the solid body. You should be looking at something like this. On the surfaces tab select Knit Surface and select all 4 of your surfaces. Make sure you have the "try to form solid" box checked. You will now notice your Surface Bodies folder has vanished and you have two solid bodies. Up top go to Insert>Features>Combine. Make sure the Operation Type is Add and select both solid bodies. 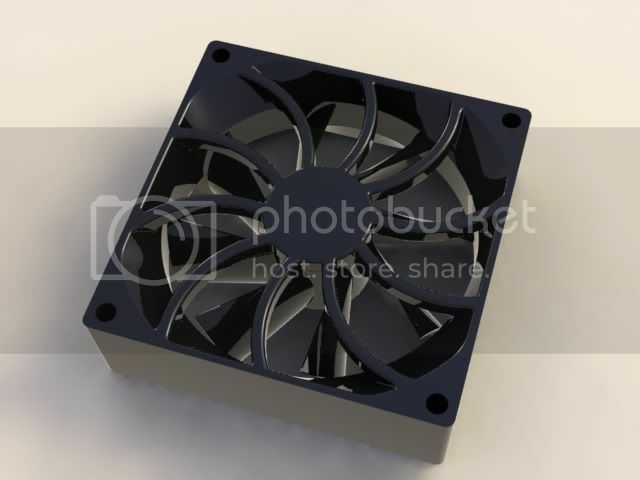 You should now have a solid body that represents the main part of the fan. Next we start to build the grill of the fan. Start a sketch on the top face of the solid. Starting it on the face ensures that if we change our original extruded height this will stay the same in relation to the model. Draw a circle at the origin with Diameter 25. If you are wondering yes I am making these numbers up. Without having a fan on hand(and since we arent producing one) making things visually close is all we need to be concerned with. 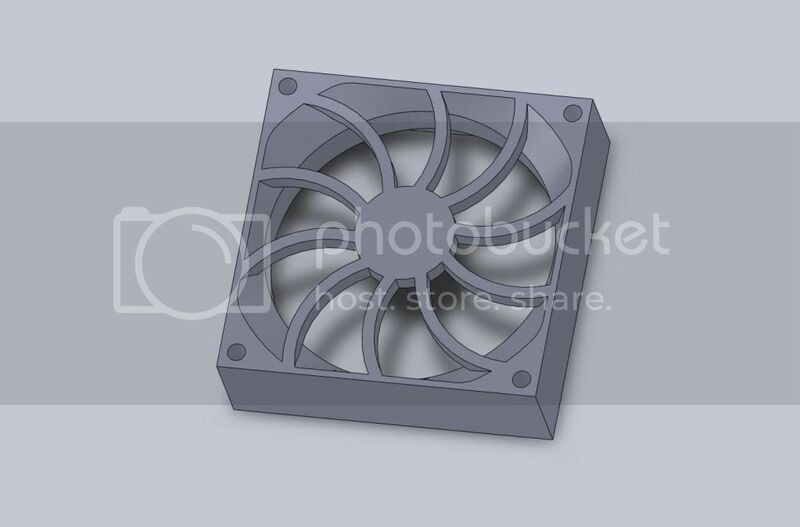 Extrude this circle 5mm down into the fan. On the same face start a new sketch. 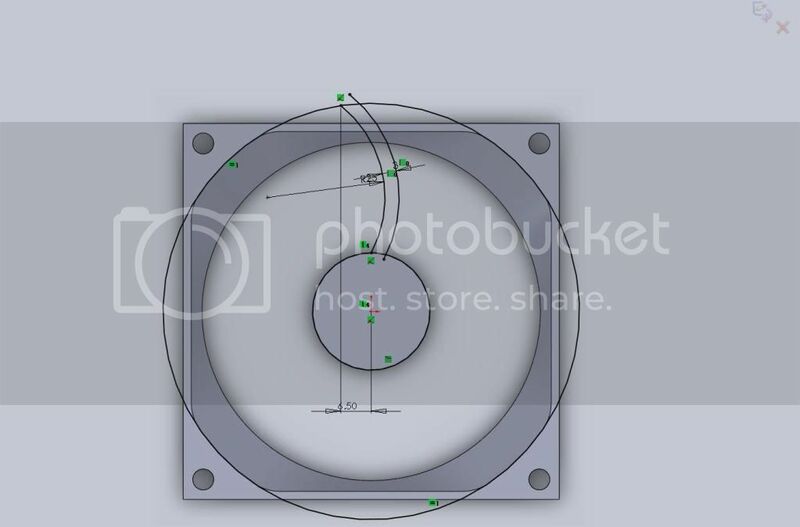 I start by converting the 25mm circle and then drawing a larger circle and applying an = relation between it and one of the arcs from our original 88.6mm circle. It is important to use relations whenever possible. It cleans up the drawing and ensures things update when altering things later. Next draw an arc from the top point of the small circle up and to the left. I gave mine 6.5mm offset from the origin and a 25mm radius. Then I offset it 3mm. Now trim all the excess lines you dont need. 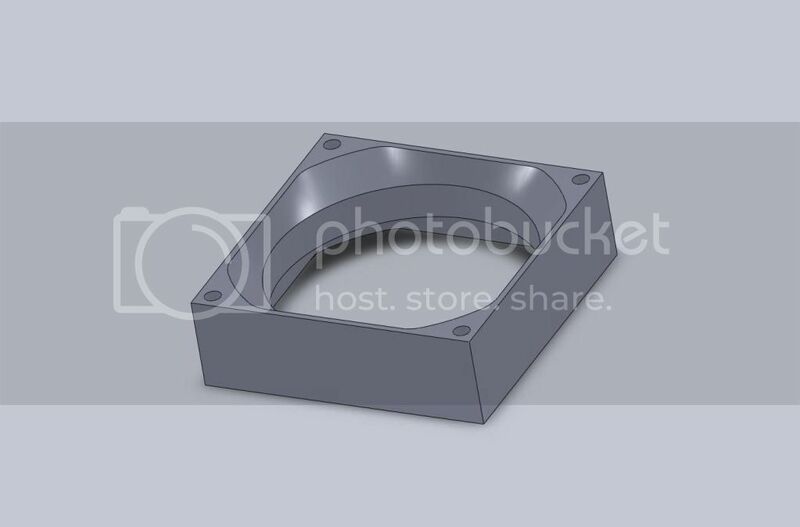 We are going to extrude this 5mm as well but make sure you Deselect the Merge Results box. We do not want to combine this with the rest of the solids yet. 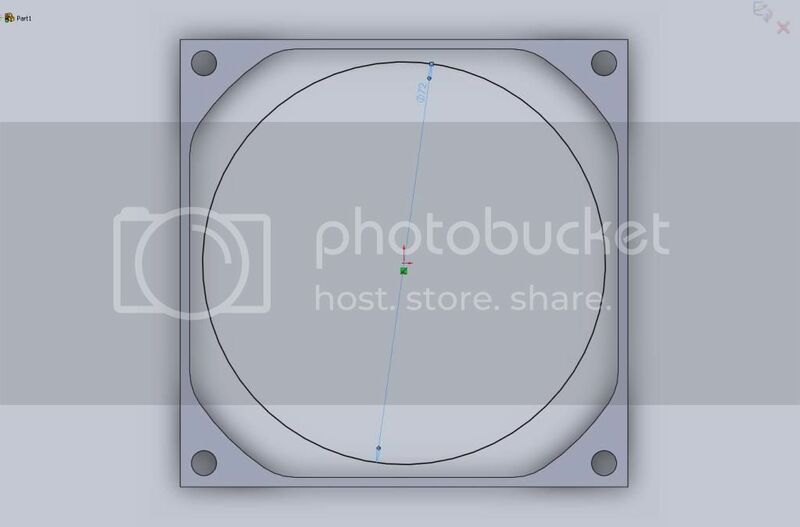 Do a Circular Array making sure you select Bodies to Pattern(and not features). I create 10 with equal spacing. Next start another sketch on that same face we have been using. 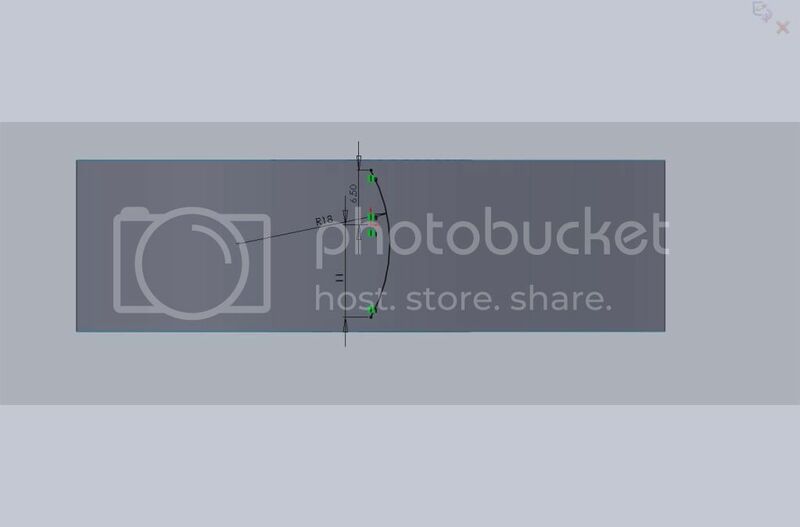 This time you will want to convert the edge shown into your sketch. 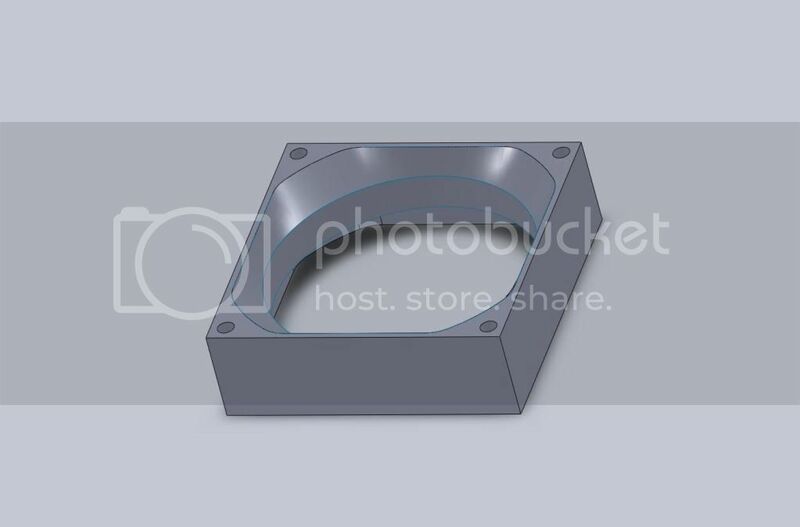 (note, there are many different ways to make this kind of a part and this is only one of them. I am not saying its the best way, but its easy to follow). 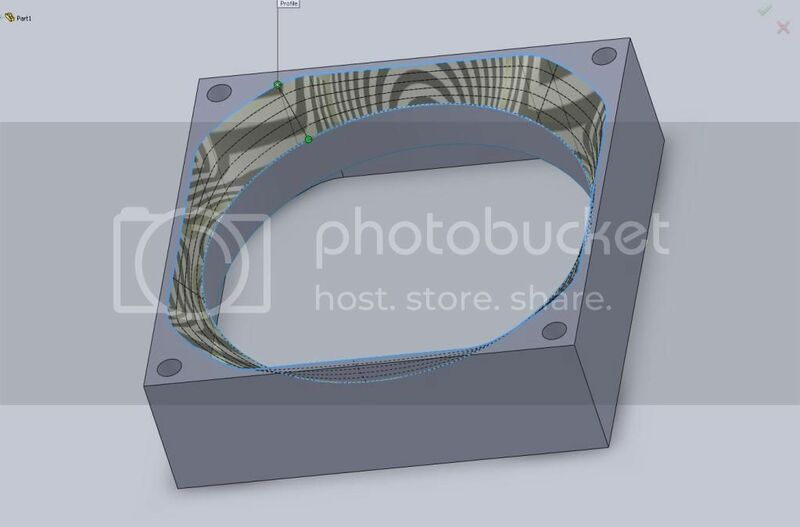 Before we extrude this lets use Insert>features>combine and add all the circular array pieces to the center 25mm circle. Now someone might be saying "why didnt you just add the extruded arcs to the 25mm circle then made the circular array a feature". No specific reason. There are several different "roads" to take so please dont think this is it. Now that you are back down to 2 solid bodies, extrude that sketch we just created(yes a solid extrude) and be sure that you do not select Merge Results. Another note for you. 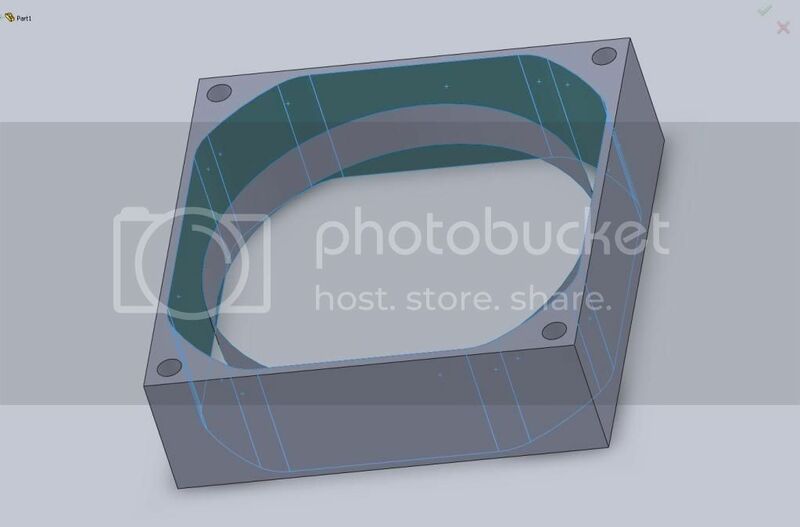 Instead of using 5mm extrude distance each time, a better method is to choose "up to surface" and select the back face of our first 5mm extruded circle. This will ensure that if you change that one, the rest will update along with it and not produce errors(hopefully). For the purpose of this How To, it was too many extra steps to show but I feel it is a better method. Now go to Insert>features>combine again only this time we will use Common and not Add. It may be easier for you to hide the main body and only keep the "sun" and the last extrusion visible. You should be left with a "sun" that fits the shape of the main body. Go ahead and use Combine again and Add it to the main body. Now is the fun part, the actual fan with blades. 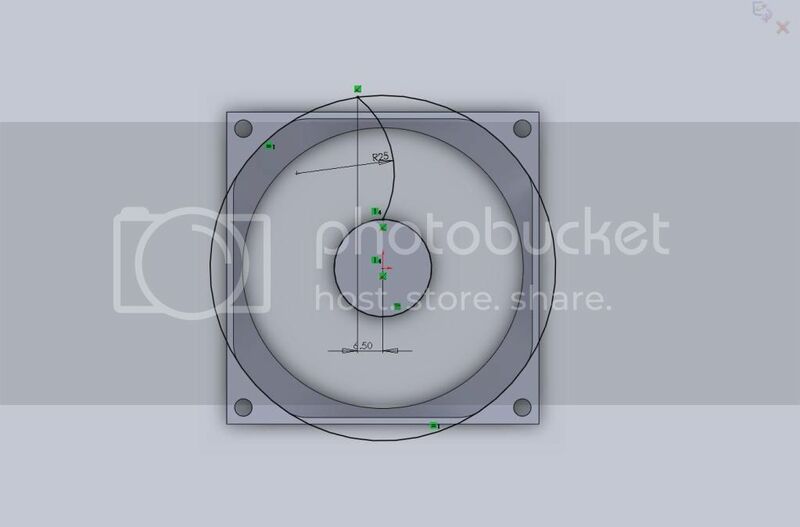 Start a sketch on the underside face of the "sun" and draw a 24mm circle at the origin. 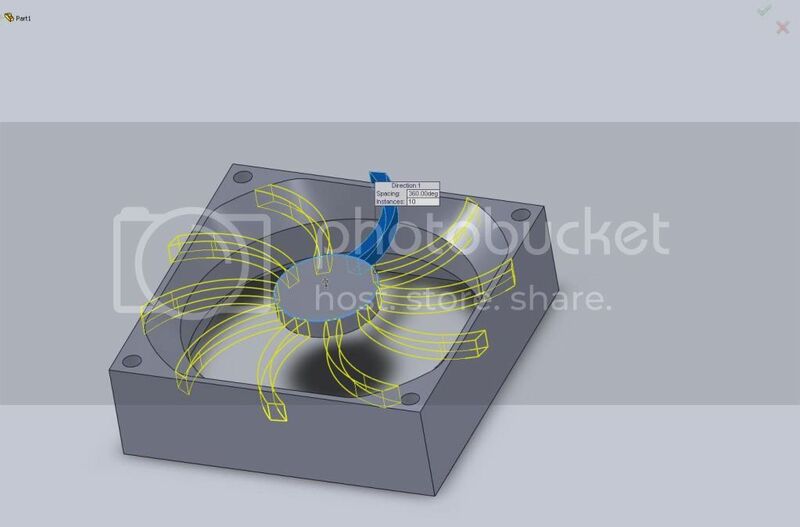 We want to extrude this up to the back surface of the fan, but make sure you do not merge results. On that same face start a new sketch and draw a 70mm circle. This will be an extruded surface up to the same face. To make things easier, hide the main body of the fan. 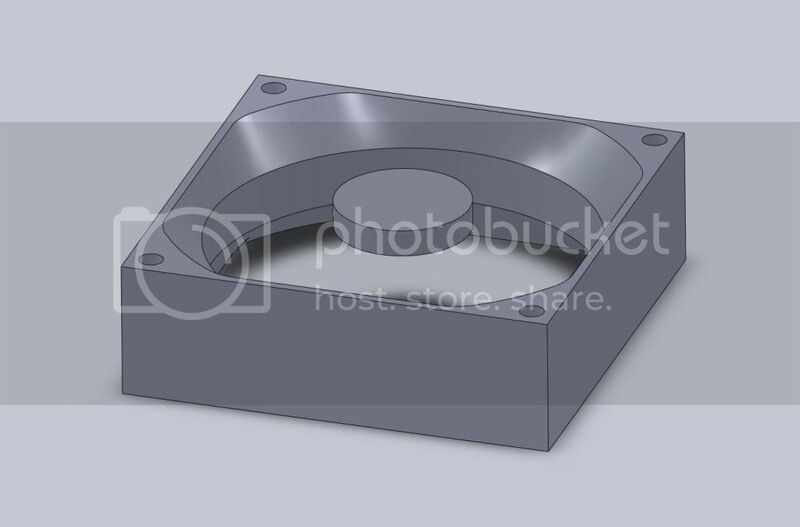 What we are going to do is use this surface, and the solid cylinder, as faces to project a blade sketch onto. 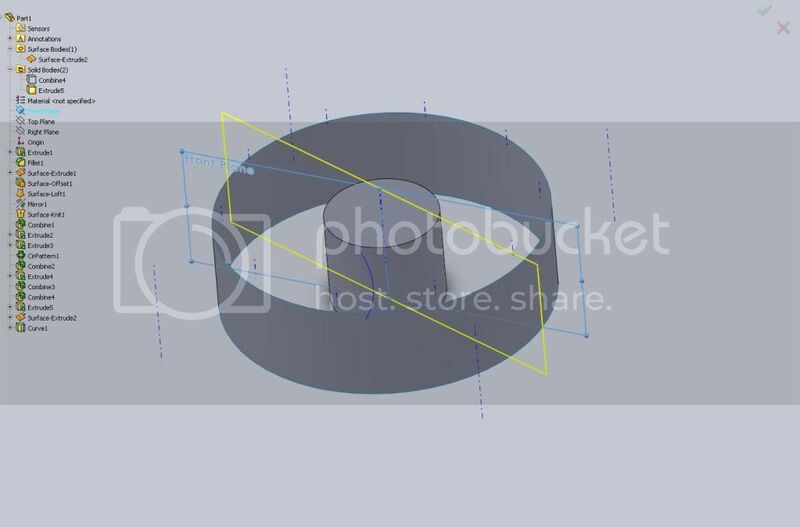 Start a new sketch on the front plane and draw an arc similar to this. 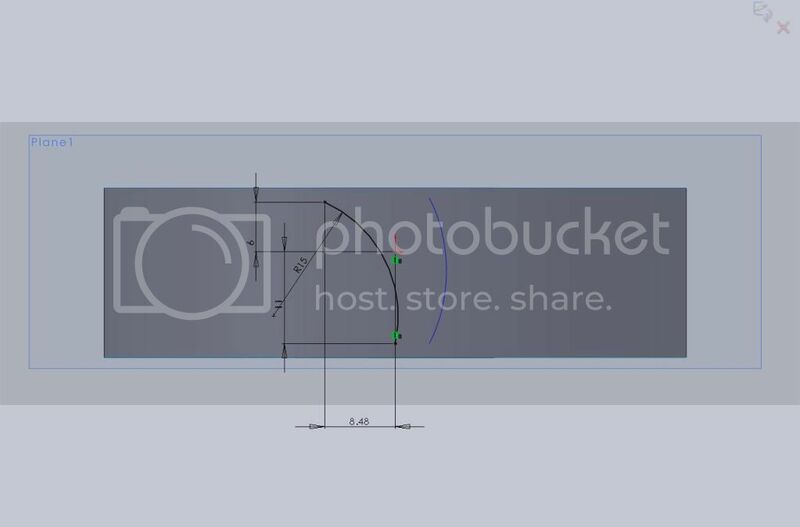 On the Features tab(or the Surfaces tab) click the curves drop down and select Project Curve. You want the projection type to be Sketch on Faces. 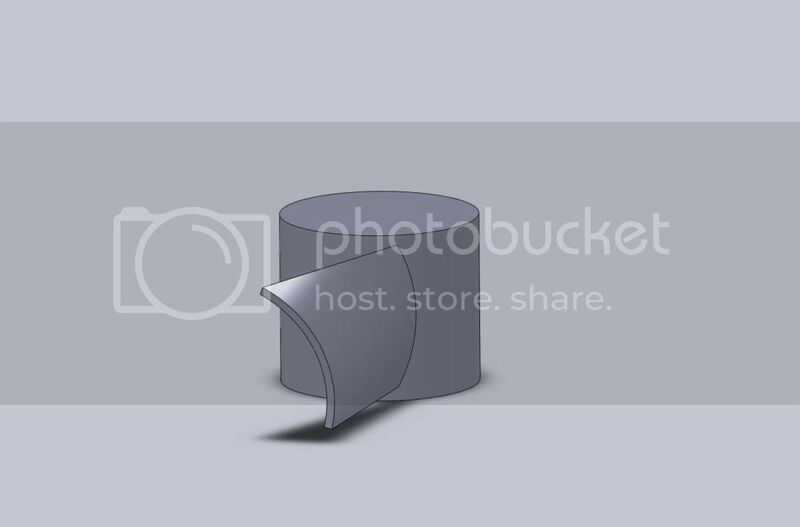 Select the front plane sketch we just created, then select the face of your cylinder. Now because we want our blade to not only twist as it exits the cylinder, we also want it to twist radially, we need to create a new plane that is angled away. On the View menu turn on Temporary Axes. Create a new plane based on the axis of your cylinder, and the front plane. Make this new plane 20degrees off. This needs to be 20 degrees in the correct direction(the opening of your arc). Turn off temporary axes and start a new sketch on the newly created plane. Draw an arc that will represent the end of your blade. I have rotated mine slightly. Go ahead and project this sketch onto your extruded surface. Nice work man, keep on going. In your surface bodies folder, right click on your extruded surface and select Delete Body. This will remove that surface since we dont need it by placing a delete body "feature" in the tree. This means that surface is there before this feature, but removed after. 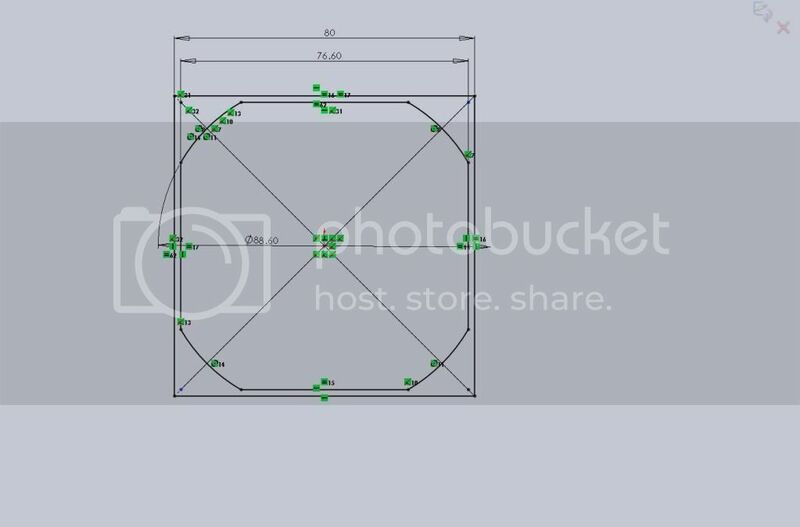 Now go ahead and create a lofted surface using these two projected curves. Note, after the loft is created, make sure you expand the loft feature and hide the curves. In models where you need to select edges of surfaces, you always want to be sure the curves are hidden and not your selection. Now on the surfaces tab, use Thicken Surface and thicken the loft 1mm. Make sure you do not Merge Results because we are going to array this new solid. Circular array the body. I chose 8 blades. Then go ahead an Insert>Features>combine and add all the blades to the cylinder. Now I go back and add some fillets. First I added two .5mm fillets to the cylinder we just combine the blades with. Then I fillet the 4 corners of the main body with a 2mm fillet. Then I fillet all the hard edges on the "sun" using filletXpert. Then finally I fillet the rest of the opening for the "sun" to smooth everything out using a 1mm fillet. And thats it. There is a lot of detail I left out of the model, but if you strictly want something for representation/size it does the trick. When you look at a 2d print you know its a fan. Sorry I had to break it up. Too many words and images to fit in one post. Nicely done Matt. Great work!!!! Thanks for spending time and sharing. Thanks bill. Hopefully there is enough info for someone to follow it. Thanks and yes it can but there are some differences to how you handle a few things. 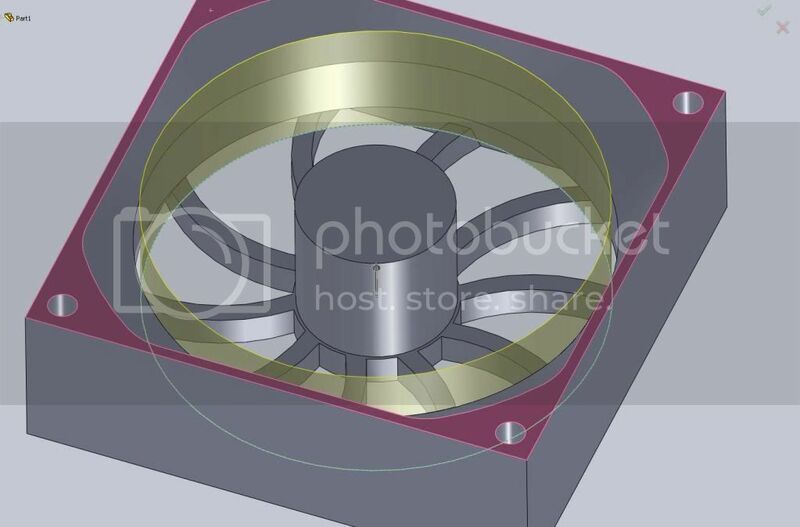 The most crucial is the projected sketches for the fan blades. 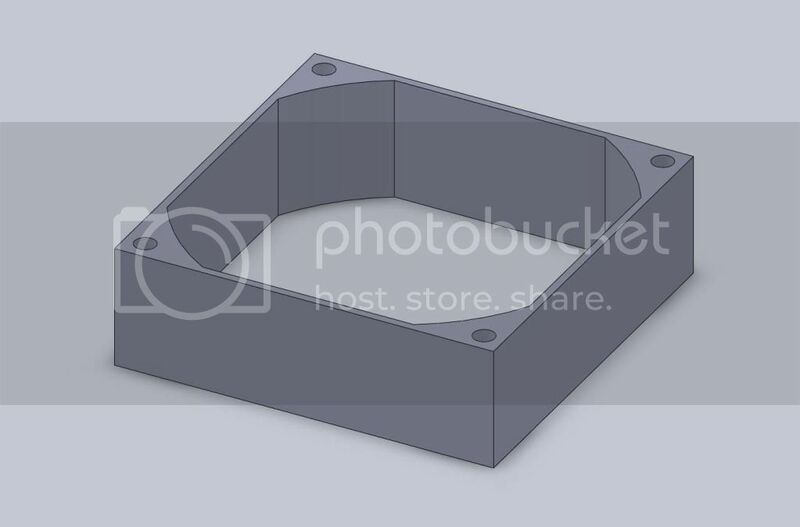 In Inventor you need to start a 3d sketch and project them in there. 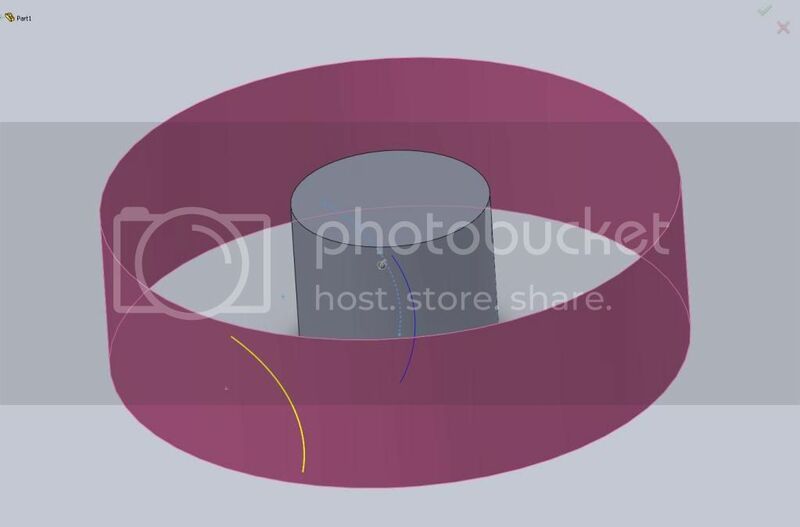 You can skip a step by not extruding the cylindrical sheet, but rather have a 2d sketch of a circle on the bottom plane, then a 2d sketch of the blade on a side plane, and use Intersection Curve(in inventor). I think everything else will be the same, or very close. 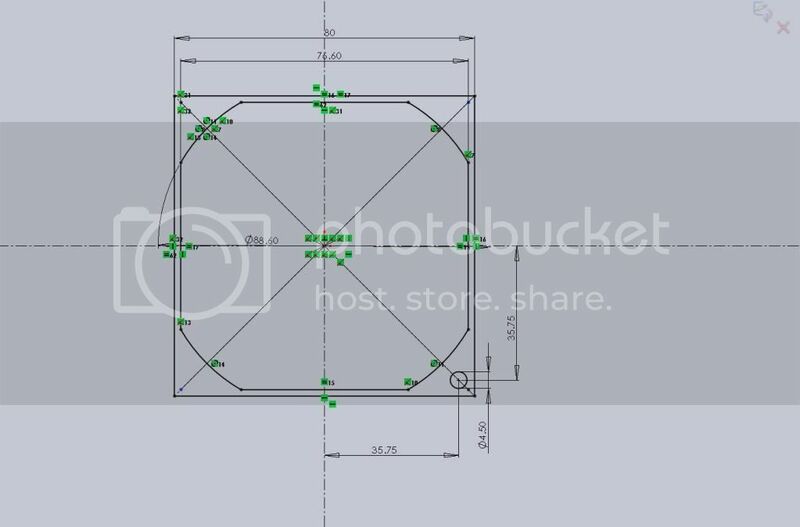 i am confused with the 26th to 29th picture (making of the grill and adjusting it with the main body ). 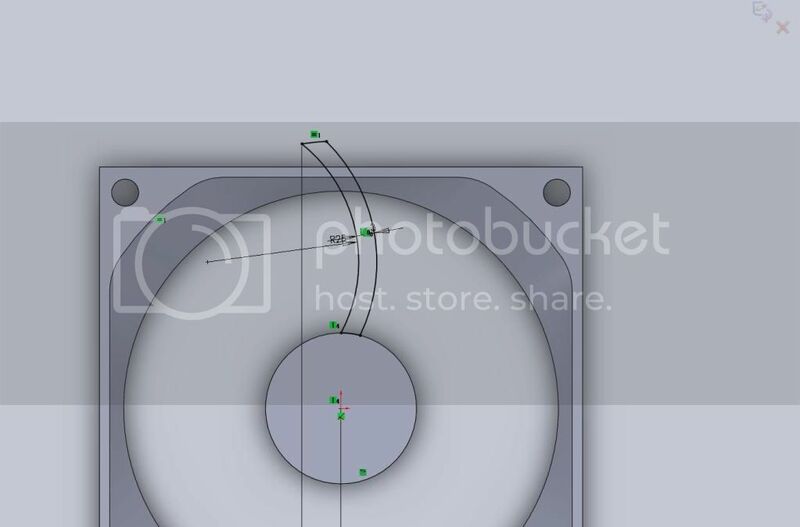 My question here is how could we remove the excess part of the circular pattern and how did you removed this part..?